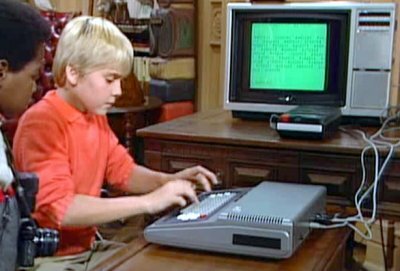 Ricky uses his Dad's Coco to run a code cracking algorithm and break into a military computer. The only concern here is whether the compute power of the Coco is sufficient to break the code. 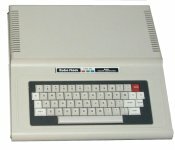 The TRS-80 used a Motorola 6809E a 1-2 MHz processor with a 8/16 bit bus and a direct page register. It is not any less believable to be used for the purposes of hacking than any other home computer of the time. It was effectively more efficient than the z80 and equivalent to the 6502 used by Apple and Atari. What's unbelievable is that he wasn't thrown in federal prison for 20 years. To be fair, anti-hacking laws didn't go on the books until 1986. I see the tape recorder (storage). Is there a modem there somewhere? Well, I've savagely beaten all other 8-bit computers in the "Fibonacci Challenge", calculating and displaying over 3000 Fibonacci numbers (up to 1024 bits wide!) in 15 seconds, using my Coco3. The program takes up less than 2kb of RAM. The 6809 makes it super easy to perform chain calculations using the A/B or D registers and carry. With proper coding, you can perform some complex calculations such as hash value and public key validation (even RSA if you're willing to wait a few seconds).